You've found the “U.S. Hampshire Sheep Breeders” page here at Hobby Farm Wisdom! If this is the first time you have visited our site: Welcome! 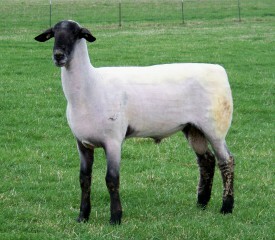 The Hampshire sheep were named by the agriculture county of Hampshire in Southern England where they were developed. The Hampshire-Down breed evolved from the mingling of different strains of kindred blood from sheep in co-existence along the borders of Hampshire County. Mature rams weigh around 275 lbs and ewes 200 lbs. The ears are covered with a coarse dark brown or black hair and free from wool. The face is dark and free of wool from the eyes down. An unbroken wool cap should extend from the neck over the forehead. Mature ewes will average a six to ten lbs fleece that measures 25.0 to 33.0 microns. The staple length will be 2 to 3.5 inches. These sheep are all horned and white-faced. They are large sheep used as terminal sires and show long breeding seasons and high percentages of multiple births. They are quiet and docile.